Mission Eureka is an innovative group game for everyone aged 8 years and upwards about more than 100 years of Philips inventions. You can play Mission Eureka with your friends, parents or grandpa and grandma in a team of 2, 3 or 4 persons. You will be presented with 8 different challenges that you have to solve together. Touch a station with the iPad and your challenge starts. Together you’ll discover how LED light works or what X-ray does. Mission Eureka is an adventure that will playfully bring out the explorer in you. 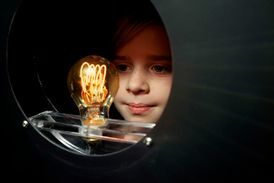 Mission Eureka is also suitable for educational purposes and ideal for an interactive children’s party in the Philips Museum. For children under 12 years is collaboration with adults required. Mission Eureka takes approximately 60 minutes and can be played in Dutch, English, French or Spanish. The Philips Museum will be closed on New Year’s Day (1 January), the Saturday before the Carnival weekend (25 February), Easter Sunday (16 April), King’s Day (27 April), Whit Sunday (4 June), Thursday 12 October 14.00 - 17.00 hrs. and over the Christmas period (25-26 December).